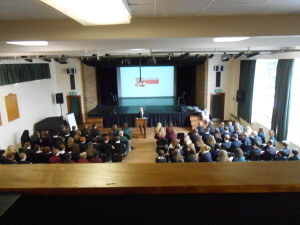 “Paul Stocker spent an afternoon with our Year 10 and Year 11 Germanists. Denbigh School in Milton Keynes has a long-standing link with the Gesamtschule Schwerte in the small town of Schwerte, near Dortmund. As an initiative to encourage students to take part in the exchange programme, we set up a ,Tagesaustausch’. 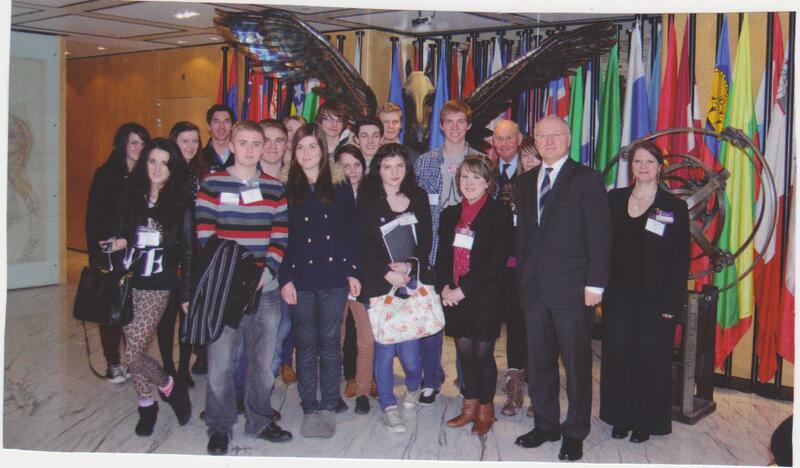 In January, a group of 20 German students from our partner school came to spend the day at Denbigh School. Each German student was partnered with a Denbigh School student from Year 7, 8 or 9 and they had the opportunity to participate in lessons. At lunchtime, the students ate together as a group and, during the afternoon, they were split in to groups to ask each other questions, in both languages of course. The students were curious to find out about the different school systems, football and food. Our students are keen to carry on their newfound friendships via email and maintain the communication and exchange visits between our schools. We are extremely grateful to Youthbridge for supporting us with this project. Have a look at part of John le Carré’s speech given at the German Teacher Award ceremony at the German Embassy London on 12th June, published in the Guardian on 2nd July 2017. A good number of schools from all over the UK have already indicated that they are entering the annual Youthbridge Awards this year, and we are looking forward to receiving their entries. There is still room for more – don’t forget that the cash prize-winners are chosen from within each school, and that names can be entered at any point in the academic year up to 1 July. National essay competition 2016: Germany and Britain: a key alliance for the 21st century? We received some outstanding entries for the first Youthbridge National Essay Competition, which was open to all, not just to Germanists. Every entrant tackled the question from a different angle – exactly as we had hoped, but it made judging the entries all the more challenging and interesting! Despite this, the judges, Paul Farrelly MP, Leader of the All-Party Parliamentary Group on Germany, and Paul Stocker (Head of Youthbridge), were unanimous in their selection of the six prize-winners, who shared £900 in prize money and received a book each. There were also a number of essays which we felt merited a Commendation and the prize of a book. On 21st March Year 13 students were treated to a whistle stop tour of the German Subjunctive delivered by a visiting expert in the field: Mr Paul Stocker. 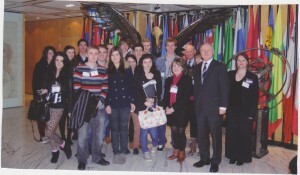 Mr Stocker came to visit King’s in his liaison role for Youthbridge, with the British-German Association. He previously worked for 22 years as Head of Modern Languages and Head of German at Uppingham School. However King’s 6th formers are already familiar with his name for a different reason: as the author of their German Wort für Wort vocabulary guides! Mr Stocker is a very successful author, having sold around 200 000 copies and bringing out his nineteenth publication. ‘A Student Grammar of German’ with Cambridge University Publications (April, 2012). The Year 13 Germanists warmed quickly to his humorous delivery, and worked with enthusiasm through the tasks prepared for them. The time passed very quickly; by the end of the lesson Mr Stocker had given the students a number of useful tricks and succeeded in presenting one of the most complex aspects of German grammar as not only enjoyable but remarkably easy! Proof was in the plenary, as students were able to use their knowledge to report back a variety of activities in all three tenses, without referring to the lesson notes; remarkable! After the rigorous teaching Mr Stocker was then able to sit back and enjoy Kaffeekränzchen with the 6th form students. This is a weekly break time club, led by Lisa Ostermaier, and provided a much-needed Kaffee and a slice of homemade Kuchen. Meanwhile the sixth form students had to invent a story, speaking for as long as possible in German before the ticking bomb ‘exploded’, designating the next speaker’s turn. It was a humorous quarter of an hour, as the Easter Bunny suffered a job crisis and looked for alternative employment. Mr Stocker then spent time with Mrs Houghton, Head of German, discussing useful networking links and resources for German learners, before joining the Linguavox team in the lunchbreak to find out more about the forthcoming fourth issue, which takes legend and folklore as its theme. It was an interesting strategy meeting, considering how best to utilise the publication within the school. It was a pleasure to have Mr Stocker with us for the day and we are very pleased with the input and ideas he was able to share with us. We look forward to working with him, and the British German Association in the future! We are delighted to announce a new essay competition which is entirely separate from our Youthbridge Award competition. Schools can enter either or both competitions; it is entirely feasible for pupils from one school to win prizes in both, as the Youthbridge Awards are adjudicated ‘internally’ within each school, while this new essay competition is a national event. Book prizes will also be awarded. Prize-winners and their teachers will be invited to receive their prizes and certificates at an event in London. Closing date: 1st May 2016. Please see the FLYER attached with all information regarding entries – perfect for your notice boards! With Germany one of our key allies in Europe, and with the IN/OUT Referendum looming large we hope this competition will provide your students with an excellent platform to air their thoughts. We wish you and your students the very best of luck! The British-German bilingual theatre production called Messerschmitt v Spitfire A Love Story is a show developed by the Theatre Co Blah Blah Blah in Leeds and the German Theaterhaus in Frankfurt looking at Britain’s and Germany’s shared past and the current reverberations for young people today. The group is doing a tour in Autumn between September 29th and November 13th. If you are interested in inviting this high quality piece of work into your school, please contact Cas Bulmer, Tour booker from the Theatre Co Blah Blah Blah: 0113 380 5646 or have a look at the website: www.blahs.co.uk. Read more about the making of the piece for school and university students in Britain and Germany. Please click here for some brief information regarding a Workshop being organised by the Migration Museum Project which may of interest to our Youthbridge Schools, your language assistants and of course your students. MMP is running an extended morning exhibition view and workshop on Wednesday 24th September, at Senate House, Malet Street, London WC1E 7HU from 09:30 – 13:00 with assistance from a visiting group of German sixth formers. The workshop will be useful for KS4 and KS4 pupils studying German. More information will be sent out in due course to those registering interest. We would like to get this on the radars of our Youthbridge Schools as soon as possible so you can think about either attending individually or bringing your students. A most impressive gathering of German Teachers assembled at the Foreign and Commonwealth Office in London for the annual award ceremony at the “Sommerfest der Deutschen Sprache” at the invitation of the German Ambassador. We were pleased to see many of our Youthbridge Schools in attendance. The Baroness Coussins made an impassioned speech about the importance of learning German which can provide all the arguments you may need when defending the “German” corner in the allocation of funds for languages in schools. To read Baroness Coussins’ speech in full please click here. The BGA were delighted to be present to see Gavin Mills of Homewood School in Kent win the first prize at the German Teacher Award, held at the Ambassador’s Residence in June. Another of our Youthbridge schools, Bourne School was also represented in the runner up category by the very worthy Ian Smith. 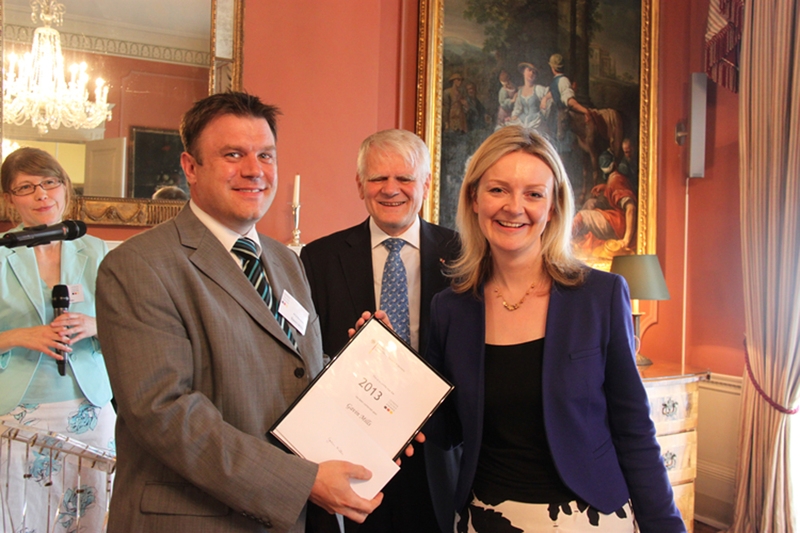 Elizabeth Truss MP Parliamentary Under-Secretary of State at the Department for Education and avid Germanophile , presented the prizes and extolled the virtues of the German language and its importance to students today. Homewood School & Sixth Form Centre became affiliated to the British German Association’s Youthbridge scheme in 2004 and we have enjoyed being an active member of the scheme ever since. The Youthbridge scheme helped to fund data projectors and speakers in every German classroom as well as the installation of a satellite television system in the department to give access to German television at all times. The department has used this to show live sporting events at lunchtime to pupils interested in everything fromthe Wimbledon tennis to the Tour de France. We have always been keen to take part in the competitions organised through Youthbridge and have always had a wide range of imaginative entries for the Youthbridge awards which have encouraged students to continue their German learning and rewarded them for their excellent achievements and efforts. As a Youthbridge school, we were kindly invited to the Bayer exhibition at the science museum to celebrate the company’s 150th anniversary to which we sent an excited group of Year 9 pupils who enjoyed the experience immensely. This year sees our partnership with the British German Association step up a gear. With its help and generosity, we have been able to grow our long-running, 10 day German exchange to Koblenz whilst maintaining the cost at its current level in times when families are feeling the pinch. Our partnership with the Max-von-Laue Gymnasium is very strong and we are proud to continue to develop one of the few German exchanges in our area outside of the grammar school sector. students who will be working with them during the course of the day. We are very proud that German is thriving at Homewood and this is down to an extraordinarily dedicated team of staff, a very supportive management team and the support from such organisations as the BGA. 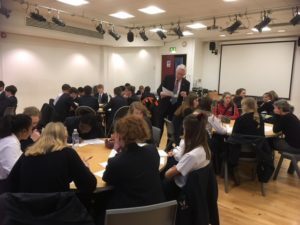 THE BGA helped Bourne Grammar School in Lincolnshire who, in cooperation with the Goethe-Institut London, hosted Masterclasses in German GCSE for schools all over the county to tackle those aspects of German that English learners typically find difficult. “A rather belated ‘Danke schön’ for the superb German day which you organised a couple of weeks ago. We have had a lot of positive feedback from our girls and they came away very motivated and with lots of new ideas particularly for their writing and speaking assessments. and runner up at the German Teacher Award held at the German Embassy’s Sommerfest der DeutschenSprache. 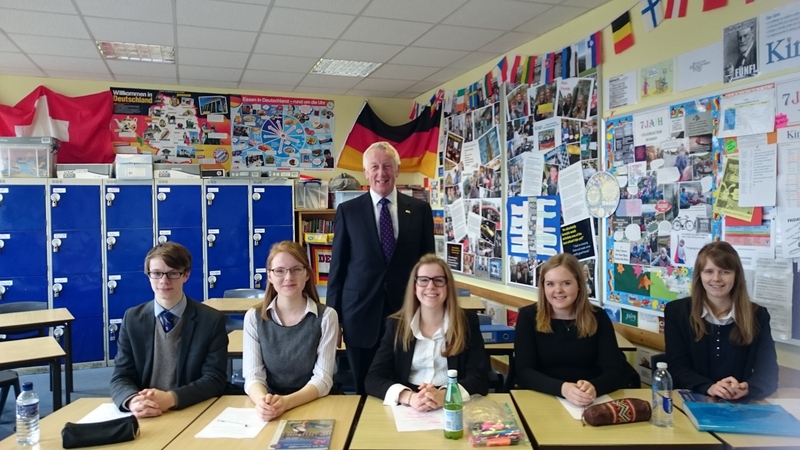 Fifteen students studying A Level German at Queen Elizabeth Sixth Form College Darlington visited the German Embassy as part of a “German Day in London”, organised by John Hobley, Vice-Chairman of the British-German Association. The day started with a presentation by Christin Stein from the Embassy’s Department of Culture and Education. After lunch at the Embassy, the group was escorted to the Saatchi Gallery in Chelsea to enjoy a guided tour of the “Gesamtkunstwerk – New Art from Germany” exhibition. They then went to the City of London where they had a meeting with Joachim Schwarzer, Director of the German Office of the European Bank for Reconstruction and Development. Mr Schwarzer explained the role of the Bank and described some of the Bank’s current projects. Wiener Schnitzel and Käsespätzle as well as freshly baked Brez’n and a soft drink unique to Germany – Spezi – a mix of Coke and Fanta. Picture: Students with Joachim Schwarzer, Director of the German Office of the European Bank for Reconstruction and Development.